Have some white bread or challah wasting away? More than a few slices? Me too! Which is why I used 6 slices of old bread to make this Crème Brûlée French Toast. This french toast has a butterscotch base. Sounds pretty fabulous, but in all honesty I could have done without it. I thought adding maple syrup tasted better than the butterscotch. 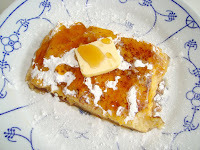 This Crème Brûlée French Toast has very positive reviews, both on Recipezaar.com and AllRecipes.com. I can't deny that this french toast is a 'special occasion' type of toast, but it's definitely not my favorite french toast recipe. Rating: 3 out of 5. 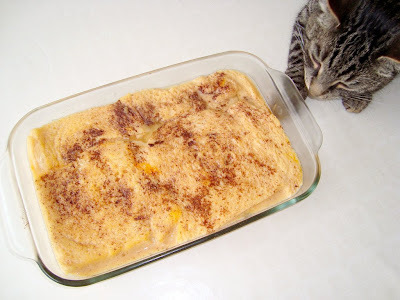 - Remove crusts from bread, and arrange in the baking dish in a single layer (I had two layers). 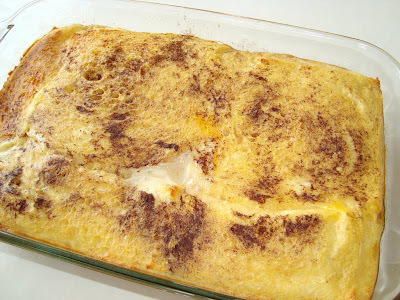 - In a small bowl, whisk together eggs, half and half cream, vanilla extract, orange brandy, and salt. Pour over the bread. Cover, and chill at least 8 hours, or overnight. - Preheat oven to 350 degrees F (175 degrees C). Remove the dish from the refrigerator, and bring to room temperature. - Bake uncovered 35 to 40 minutes in the preheated oven, until puffed and lightly browned. After cooling for 8 hours in the refrigerator. Down kitty! Right out of the oven. Btw, that brown 'stuff' on top is some cinnamon I sprinkled over the french toast. It didn't call for cinnamon in the recipe, but I like some cinnamon with my french toast. 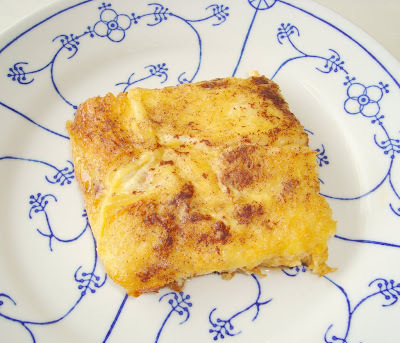 The smell that goes through the kitchen from the freshly baked french toast is divine! Like I said, I prefer maple syrup than the butterscotch syrup that comes with the recipe. Next time I'll omit the butterscotch. I have got to remember to come back to this recipe for a Sunday breakfast one day, it looks so good!